There are no shortage of options for travelers wanting to see Kenya's wildlife. With dozens of parks, reserves and sanctuaries, there are more than enough places to see the animals of Kenya. Wildlife varies from park to park, so you can make your itinerary based on the animals you hope to see. 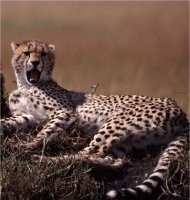 The Masai Mara park is not the largest, but it is the most famous of Kenya's wildlife safari parks. It's one of several parks located in the vast expanse of grassland that makes up most of Kenya's landscape. All of the Big Five game animals can be found here, as well as hippos, cheetahs, gazelles and giraffes. And each year, a million-strong herd of wildebeest comes thundering through the park, becoming an additional tourist attraction. The park is located in the south-west of Kenya, near the border with Tanzania. The animals you will see at the Masai Mara park are much the same as at the East and West Tsavo parks, or the Samburu National Reserve. The Nairobi National Park is particularly unique because it's actually within the capital city limits. Another grassland park, you can see giraffes, zebras, lions and ostriches. There is also a very popular black rhinoceros sanctuary in the park, an animal that can be hard to spot due to their dwindling numbers elsewhere. The Sheldrick animal orphanage is located in this park, where young elephants and rhinos are raised. The Meru park is in the central part of Kenya, and offers a wet and swampy terrain with numerous rivers. Spotting animals is not as easy as on the open plain but its not as busy a park as some others, offering a more personal experience for the tourist. Here live animals like the elephant, hippo, cheetah and possibly rhinoceros. A park surrounding the highest mountain in Kenya, with wildlife such as elephants, buffalo and several different species of monkey. There are baboons and some rare species of antelopes: the bongo and suni. There are hiking trails up the mountain, offering some spectacular views of Kenya. 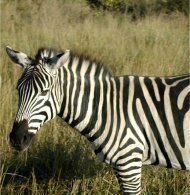 You won't often find the typical grazing animals like zebra here. The Lake Nakuru park is famous for one thing, and one thing only. The flamingo. The lake can be covered with tens of thousands of these pink birds, making it a very unique spot for animal-watchers. Baboons, warthogs and the occasional giraffe come to drink at the lake. Another black rhino sanctuary is here, as well. This park is located at the very southern tip of Kenya, not far from the coast. It has a rainforest ecosystem, providing a very different environment than most other parks. The most populous animal in the park is the elephant, to the point where animals are being exported out of Shimba Hills to protect the landscape. Aside from the elephants, you can also see the very rare sable antelope, and a variety of large bird species. To see some of Kenya's wildlife that live underwater, you can head to the coast near Mombasa. The Mombasa Marine park is home to a large coral reef, and has crabs, jellyfish and many species of fish. There are boats for tourists, or the more adventurous can go snorkeling or scuba diving.